A couple of claymation misfits who are worlds apart, form an unlikely dialog, in a pre-Internet age where it takes weeks to get a reply. There is a growing trend amongst publishers and in Hollywood, where the writer is strongly urged to rather show the story rather than tell it. This is fine for certain works, especially action films, but I personally believe that the aforementioned edict is a steaming pile of moronic dribble. People are more than intelligent enough to garner rich satisfaction from being provided a story in any form as long as the story itself holds interest. Its worked fine for all the classics in literature, most of which are still being read in droves, but many believe that audiences are stupid and need to shown everything and must capture their attention in the first five seconds. Indeed, most manuscripts are rejected based upon their first page, a ridiculous scenario. In this case, there is much in the way of telling via the voice-over of the wondrous Barry Humphries and yet the visuals provide us with an extra layer on information, working with the voice-over rather than being hindered by it. Occasionally it goes on too long, but Adam Elliot is incredibly brave in wanting to tell this story his way. 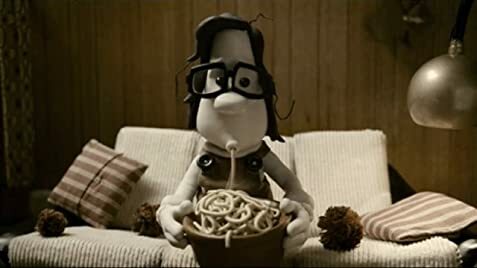 Aside from stylistic similarities to his earlier shorts, he has remained true to himself. He thanks a lot of people in regards to his script; its clear he has made the effort to get it right, proving the basic notion in screen writing, is to get right on the page first folks. The script is a gem, finding the humor in a rather grim tale, without ever being patronizing to the characters or their plight. If anything, he manages to reinforce their humanity. The choice of music is ideal, setting a tone that is complimentary and yet as though these classical pieces were designed specifically for this wide, but often claustrophobic gray universe. I hope audiences embrace it on the big screen as there is glorious detail lurking in the background, providing an extra chuckle or irony for the keen eye. If there was ever a reason to leave the home theater, this is it. 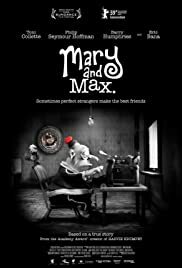 Mary and Max is a brilliant, entertaining work of visual art combined with depth and grace. There was a couple of moments when I raised eyebrows at certain things that didn't fit correctly for the late seventies, such as the mention of Stephen Hawking as well as cigarette patches (which debuted in the early 90's) but otherwise this laugh out loud, tear to the eye unique celluloid experience is one of the standouts of the year.